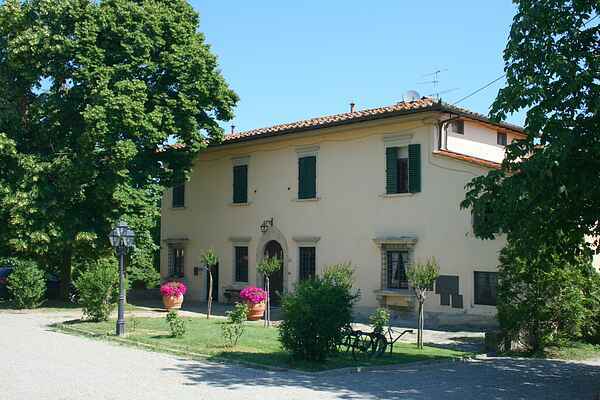 This old Medici villa of around 800 m2 has undergone recent renovation work and is furnished with care. The villa is located 35 km from Florence and is situated on a traditional Tuscan farm estate. Villa guests can make use of a private garden with a pool measuring 5 m x 10 m and barbecue, while villa and apartment guests share use of the tennis court, a smaller pool measuring 7 m x 14 m, a ping pong table, a large lawn with tables and a barbecue for open air dining, a laundry and the agriturismo's own restaurant-pizzeria. Meeting rooms have recently been opened, built in the distinctive, former wine cellars. Apart from hiking along the area's walking routes, why not try mountain biking, canoeing, fishing or horse riding in the nearby riding school. The surrounding area is also home to the international Mugello racetrack and Scarperia golf course.